Disclosure: Links on Simply Shoeboxes may be affiliate partners or referrals. I have found a fun blog party to join this summer to work on purging my stash of scraps and fabrics that seem to stay in my stash for far too long. Using up the older, not so loved fabric. Of course I am purging for a cause: to fill my Operation Christmas Child shoe box gifts with hand made items. One of the first scraps I came upon were these from when I made heavy duty bean bags for our AWANA kids at church to use during game time. The ones they had purchased kept tearing and I kept mending them. I finally decided to make some and since I did two or three years back I have never had to mend one. 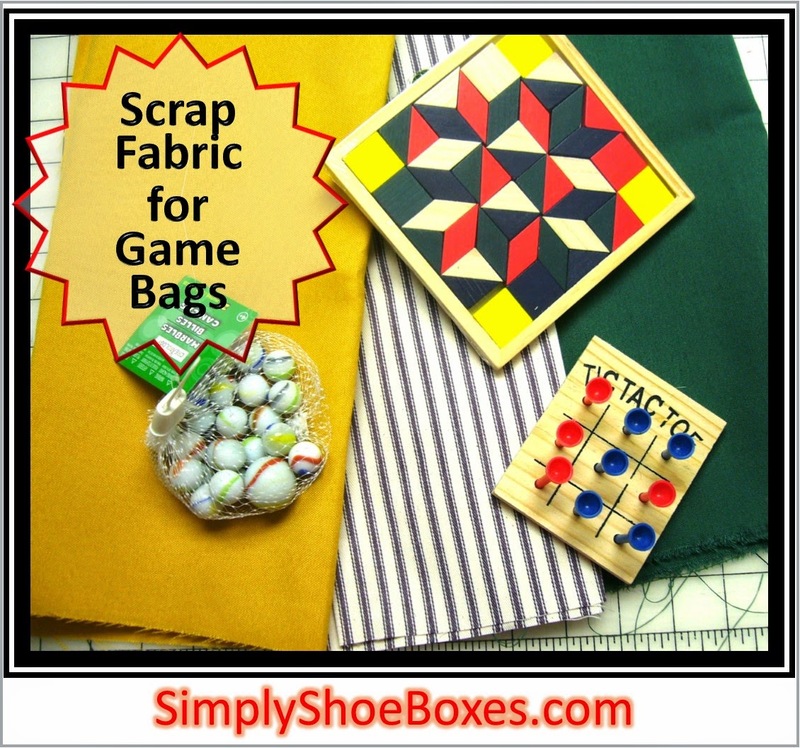 I thought this tough fabric would be perfect as marble bags and bags for other small games with many pieces to tuck into a shoe box. This way the child will have a convenient way to keep all the pieces together. Off to stitch a few! If you'd like to sew some drawstring bags for your Operation Christmas Child shoeboxes we offer several simple ones on our Simply Shoeboxes Crafting Tutorial Index Page. what a great stash buster! Proceeds from advertising on Simply Shoeboxes helps us be able to keep the site running. We do not endorse all products and services shown in randomly generated ads. Copyright 2017 by Simply Shoe Boxes. Powered by Blogger.